Little Lobbyists know our children with complex medical needs and disabilities will grow up to be adults with complex medical needs and disabilities. This is why legislation like the Disability Integration Act, which seeks to end institutional bias and secure everyone’s right to choose to live in their communities instead of an institution - regardless of level of need - is so critical to protecting the civil rights our children deserve. This year, on Martin Luther King Jr.s birthday, the Little Lobbyists were invited to speak at the re-introduction of the Disability Integration Act with members of ADAPT, NCIL, other disability rights advocates, and members of Congress. The following text is from Erin Gabriel’s speech, mom of Little Lobbyists Abby, Bridget, and Collin. Erin, who lives in Pennsylvania, was also asked to introduce Senator Bob Casey (PA) by the Senator himself before he gave his remarks in support of this bill, which he called and important piece of civil rights legislation befitting the legacy of Martin Luther King Jr.. Image Description: Elena Hung, Erin Gabriel, and Little Lobbyists Xiomara and Abby at the podium during the DIA day reintroduction program. They are accompanied by an ASL interpreter. I am the lucky mother of three beautifully autistic children, Collin, Bridget and Abby. Abby is my youngest. She is 9 years old. 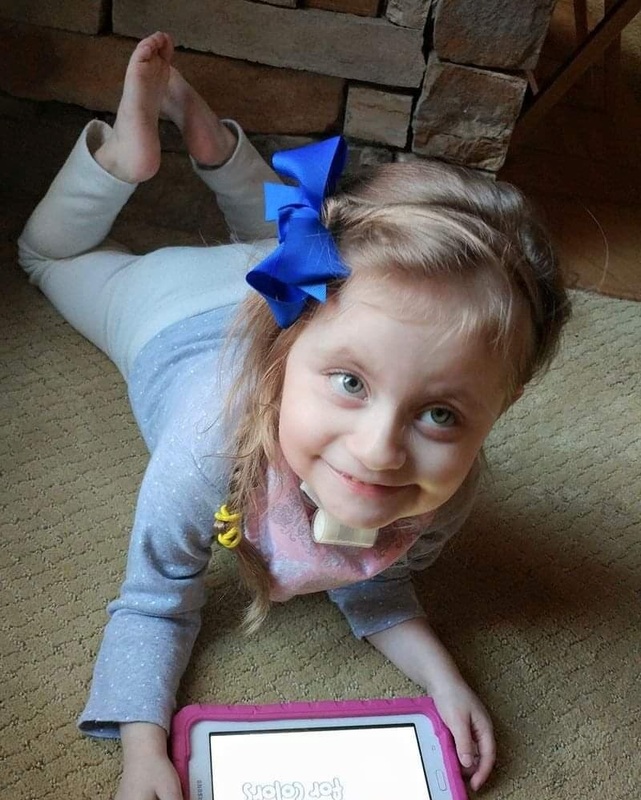 In addition to being autistic, Abby is also Deaf-blind, nonverbal, uses a wheelchair and has a long list of medical symptoms that go along with her genetic diagnosis. She has a rare, progressive and degenerative syndrome that we are still trying to learn more about. Medically, Abby has had to go through a lot. That said, she, in so many ways, is a story of everything that can go right with the system. Because of where we live in Pennsylvania, her hearing loss was found at birth and she immediately qualified for Early Intervention services as well as a home and community based Medicaid waiver for children with disabilities-Pennsylvania’s version of the Katie Beckett Waiver. We have been able to find therapies and treatments that have helped her – all while living at home with her family. Abby’s syndrome is progressive. She will eventually lose much of what she has gained. Her seizures will return and intensify. And as her disease progresses, we know she will need nursing care at home to help with her daily needs. With the waiver, we know that when the time comes, she will be able to access the care she needs until she turns 21. But our waiver is not available to every child like Abby. It varies significantly state by state. And without that waiver, insurance companies use an institutional bias and won’t provide the home care so many of our children need. That means they will pay for care in a nursing home, but not in your own home. It’s part of why we live 600 miles away from our family- because Abby’s access to care literally depends on her zip code. And when she reaches adulthood, that waiver will go away. Her services will stop, including any therapy and nursing care she has. She will be put on a wait list that extends for years. Her health will continue to decline during that time, while she waits. Right now, Abby is growing up in her community, with her family and friends. She goes everywhere with us. She enjoys shopping, going to movies, even going to some political events here and there. She travels. She goes swimming at our local lake. She snuggles with her dog at home. She rides all the rides at Idlewild (our local amusement park). She smiles and laughs and brightens the day of so many people around her. She LIVES her life with more spark than most people I know. She deserves to have that freedom to keep living in her community. To get a job if she can. To keep going out with her friends and to travel if she wants to. She deserves to have that choice and not be relegated to a nursing home at age 22 because of the services she will require. She deserves to actually live and not just exist. Abby and people like her deserve the right to that choice regardless of which state they happen to live in. This is why the Disability Integration Act is so important for our family, for Abby and for people like her. On January 3, 2019, the 116th Congress was sworn in, with Democratic party leadership. At 4am I had yet to close my eyes, even though I had a full day ahead of me. I couldn’t sleep because January 3rd was the day we had worked for two years to reach. The day the Nancy Pelosi regained reclaimed the gave and became Speaker of the House. This was the day that ended the Republican majority in all three branches of Federal Government. We made it. Checks and balances have been brought back to the US Government. When Speaker Pelosi reclaimed her gavel I breathed a little easier knowing that the Republican party agenda to repeal the ACA without a replacement cannot pass while the Democratic party leads one of the chambers of Congress. We saw that the GOP could not repeal the ACA even when Republicans held the majority in both chambers, but the devastating threat constantly loomed. With Democrats in the majority of the House, the threat has been somewhat neutralized for now. Instead of being on the defensive, we can resume and expand our plans to improve the framework and execution of the ACA instead of fighting off its demise. I have never, in my 40+ years of life, followed politics so closely as I have over the past two years. I have never been so personally impacted or attacked by members of my own government and my fellow citizens who support an agenda that includes removing healthcare and Medicaid supports for millions of families, including my own. That is why I joined forces with the Little Lobbyists. I could not sit and remain silent as Emma’s right to access healthcare was attacked, belittled and dismissed as unimportant. My daughter is not expendable. None of our children should be thought of as a budget line item. I was astounded when Speaker Pelosi shared credit for the Democrat’s victory with “our Little Lobbyists,” in her first speech as Speaker to House Members and the American public. When she credited part of the progress we have made during these scary and tumultuous times to the Little Lobbyists it hit a lot of us like a lightning bolt! It served as validation that the innumerable hours, late nights at our kitchen tables, butterflies as we approach the microphone to speak, or write to share stories about our families have, in fact, made a difference. In those early morning hours, between enteral tube feeds, checking ventilator settings, covering for another missed nursing shift, emergency room visits and lengthy inpatient stays, we realized that the time we have given in service of the Little Lobbyists goals have been an important part of the fight to stem the erosion of healthcare in our country. We now have allies leading the US House of Representatives, and no greater champion than Speaker Pelosi. January 3rd was the day the landscape has changed. It was the day we have had circled on our calendars since before the midterm elections. The day everything changed. Stacy’s daughter Emma is the reason she cannot sit and stay silent. Finding my voice with the Little Lobbyists. I know a lot of people say they don’t like to “talk politics.” I was once one of them. I was informed, I cared, and I voted, but talking about politics just seemed too icky. So I surprised myself a little when I decided to begin visibly and vocally engaging in politics. Aside from a term on middle school student council (one year as president, thankyouverymuch), it wasn’t something I saw in my future. I’m a graphic designer who loves helping people communicate but doesn’t particularly like conflict. I design, teach, and try to help create a more beautiful world, work which has always fulfilled me. Until, suddenly, it didn’t seem like enough. A little over a year ago, the political powers-that-be began to overtly threaten my disabled son Simon’s health care, education, and civil rights. Our country had changed in a scary way. I lost the privilege of sitting on the sidelines believing everything would be “okay.” A privilege I’m sorry to say I’d taken for granted the previous 8 years. I do have some prior experience diving headfirst into dark water, ever since a doctor told me there was something “very wrong” with my baby's brain. Any parent of a medically complex child could tell you some variation of the same story: their baby was sick and the pediatrician couldn’t help, so they sought out specialist after expert specialist. Farther and deeper they searched until they found someone with answers. Perhaps, like me, they even found themselves plunging into previously unfathomable depths (shout out to NIH Undiagnosed Diseases Network!). But ultimately, on this voyage we each discover that there’s no one better than ourselves to navigate these unchartered waters with our children. One day you realize the expert you’ve been waiting for is you. You read the wonky medical journals and memorize the vocabulary. You even train the residents about your child's conditions (OMG so YOUNG!). You learn how to separate fact from BS and you refine your advocacy – polite but very firm – until you have just enough fire glinting in your eyes for folks to know not to cross you. You will get what your child needs whatever it takes. It turns out those skills are exactly what you need to be an effective political activist. Instead of medical journals, you read equally wonky policy articles and memorize some new vocabulary (bad news: still lots of acronyms, good news: less Latin!). You train staffers (OMG why are they all so young? ), separate fact from BS, and advocate with the same firm, fiery, politeness. You will get what your child needs whatever it takes. It also turns out that both physicians and politicians are just people you need to communicate with. Sometimes the communication is icky. Some people can’t, or won’t, help you. Some will lie to you. Others will tell you like it is, but admit they don’t actually care much. Sometimes, people will listen, tell you like it is, care, and help you. You’ll see the fire in your eyes reflected in their own. You’ll learn they’ve been fighting for you all along and it’s stories like yours that inspire them. Our stories are powerful. These are our truths which we hold to be self-evident. The love of a parent for a child; of an American for justice, freedom, and equality. It’s not a perfect union, but a work in progress we must all participate in. Sometimes, people cry with you. The first Senator I visited, Debbie Stabenow from Michigan, had tears in her eyes as she took my hand to tell me she was so happy to meet us, but so sorry we were there because our government is threatening our vulnerable children. 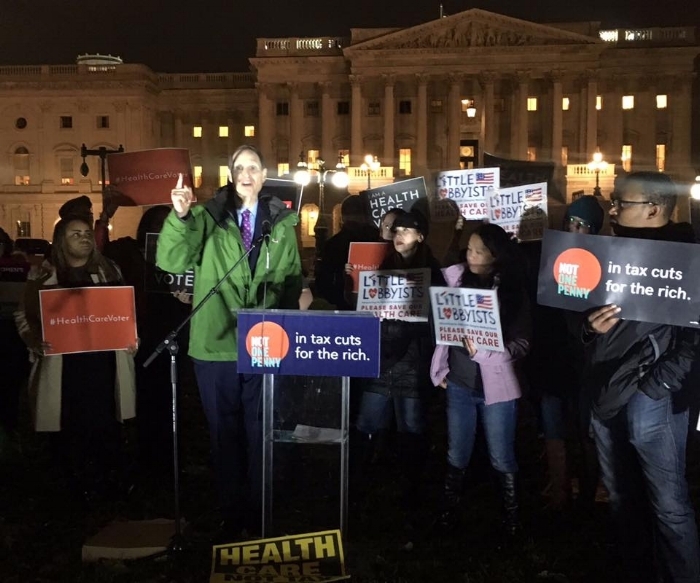 Sometimes, people race to be at your side, the way Senator Wyden ran to meet us the cold, rainy night of the “People’s Filibuster” of the GOP Tax Bill. Senator Wyden talking about the impression our kids with complex medical needs made on him at the night time People's Fillibuster. He was very kind and very, very tall. Sometimes, people give you hope. I’ll never forget shaking Senator McCain’s hand and thanking him for his vote against the repeal of our health care. His face was bruised from battling cancer but his gaze was strong and steady as he told us he cared about us. He said he prays for our families every day, and we pray for him and his. Sometimes, people embrace you. Senators Schumer, Casey, Booker, Warren, Duckworth, Harris, Bennet, Cortez Masto, Hirono, Murray, Reed, Kaine, Murphy, Hassan (whose own son has cerebral palsy just like mine), Warner, Van Hollen, Cardin, Schatz, Baldwin, Gillibrand...have literally embraced our kids. (If you noticed a blue tint… well, friends, unfortunately that’s just how it is right now. Though not from lack of effort on our part, I promise. Yes, we will keep trying.) These legislators fight for our “Little Lobbyists” because as constituents they are their children, too. 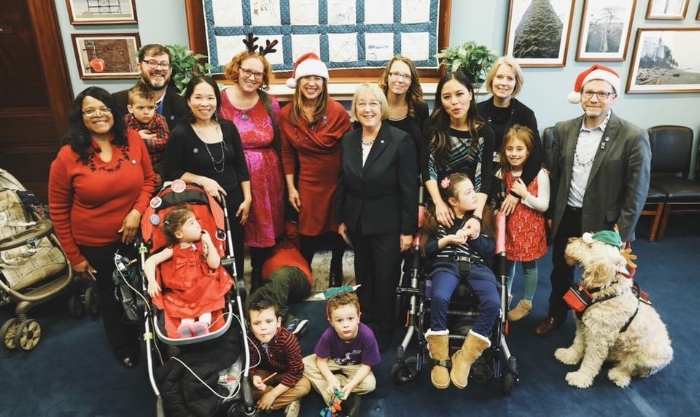 Senators Warren and Duckworth meeting some of the Little Lobbyists. So much love and so much cuteness right there. Sometimes, people empower you. 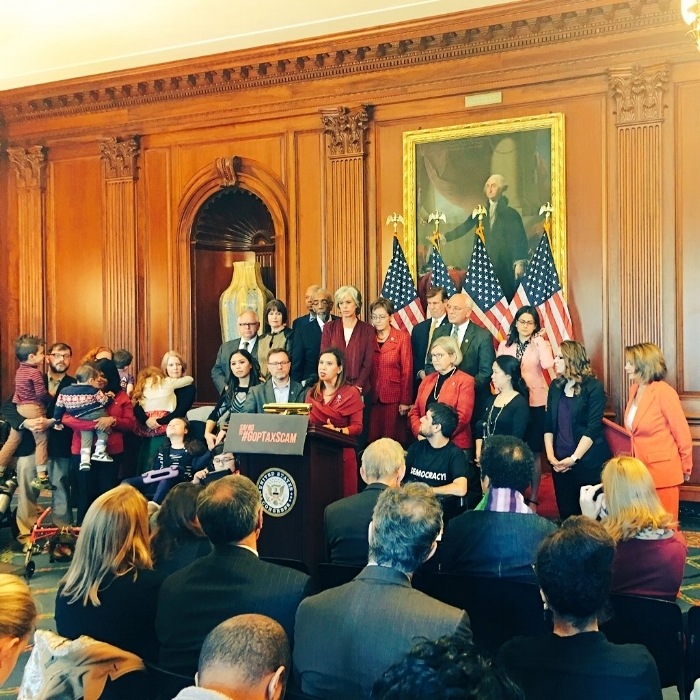 Leader Pelosi has invited me and many other parents to tell our stories at her press conferences. She carried our children’s names with her into the House of Representatives. My family’s story is now part of the permanent Congressional record. She even warned her colleagues not to “trip on Simon’s wheelchair” as they try to get between a special needs mother and the care her child requires. That’s on the record, too. Just a mom giving a speech in the Capitol at Leader Pelosi's press conference. You can watch my speech here. Leader Pelosi needed no explanation, premise, or pitch when it came to protecting our kids. She’s championed our children with complex medical needs and disabilities in every way she can. She’s a mother and a grandmother. To me, she demonstrates the impact of women in office -- they understand and vote for what our families need. Leader Pelosi knows our children and they know her, not as a political powerhouse, just as one more badass mama who loves them and protects them. Leader Pelosi thanking my daughter Olivia for being a great big sister and standing up for what she believes in. Yes I am crying, you would too. Leader Pelosi getting a hug from Little Lobbyist Charlie. No, our kids could not be any cuter. So, to all my fellow badass mamas (and papas) of kids with complex medical needs and disabilities who are already fighting and wondering what more they can possibly do, I see you. I know you’re the captain of a ship on choppy seas, made worse by the tempest our government’s created. It is terrifying to think of weathering this storm alone. So don’t. There’s a light in this lighthouse and people who will row to shore with you. Just one year ago, we came together as Little Lobbyists, and we’re continuing to grow our fleet. Families like ours are all over this country – connecting, calling, writing, showing up. We learn, share, and communicate with each other and our legislators so our children will have the more just and beautiful future they deserve. You already have all the skills you need. You’re the one we’ve been waiting for. Join us. 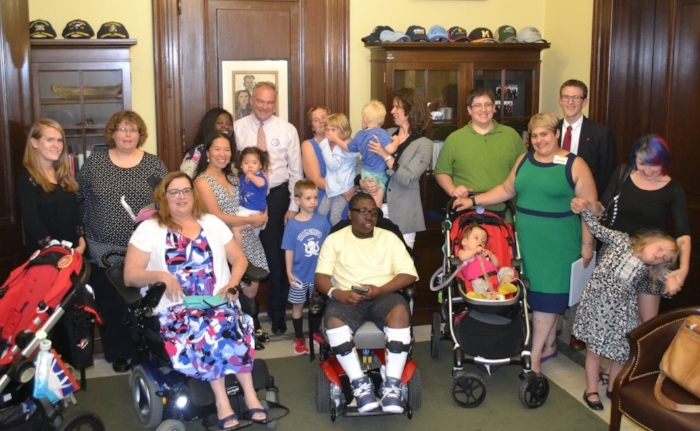 Some of our Virginia Little Lobbyists families meeting with Senator Tim Kaine. 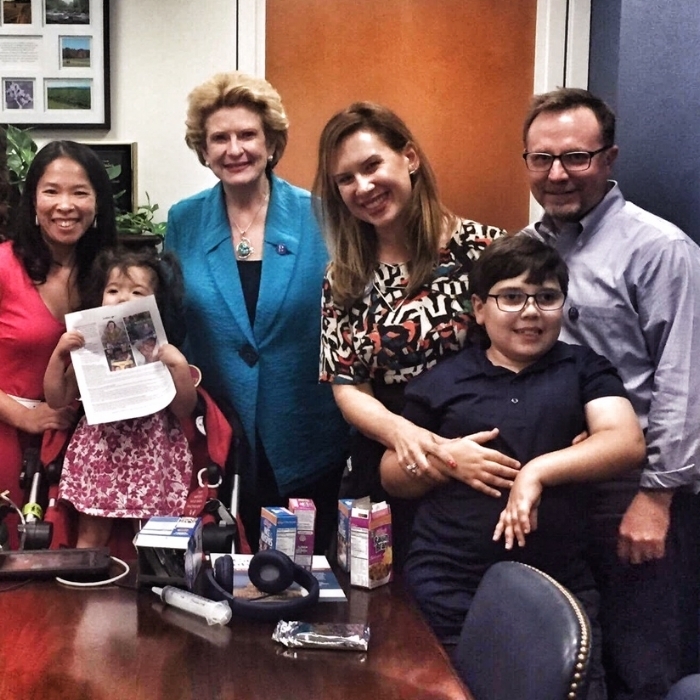 There are many ways to support Little Lobbyists and get involved! If you are the parent or guardian of a child with complex medical needs and/or disabilities, share your story with us here. If you would like to learn more and stay in touch, connect with us here. If you would like to donate to help us continue our work, please click here. 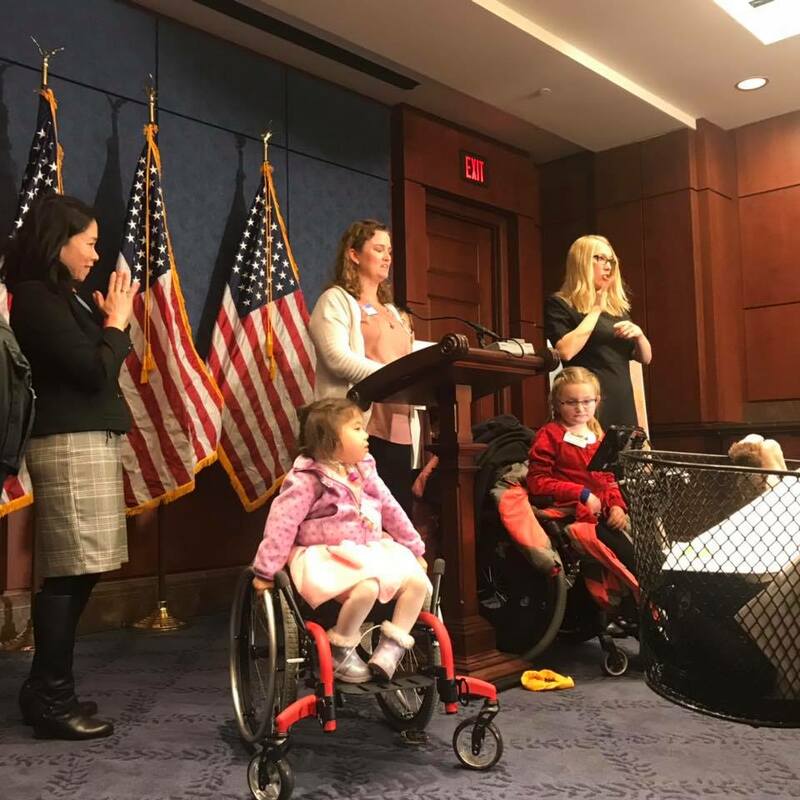 Little Lobbyists is an organization of families with one thing in common: we all have medically complex children requiring significant medical care. Our mission is to advocate on behalf of the millions of such children across the country to ensure that their stories are heard and their access to quality health care is protected. We have visited your office previously and hand-delivered the stories of medically complex children in your state whose health and future would have been jeopardized by the legislation under consideration at the time. We write again because the pending Cassidy-Graham health care bill poses similar danger to the millions of medically complex children in this country, thousands of whom live in your state. We ask that you stand up to protect our children, and demand that Congress do the same. Decreased Medicaid funding through “per capita caps” and “block grants”. Private insurance frequently does not cover home/community-based care (such as private duty nursing) and therapeutic care. Medicaid fills this gap, which allows medically complex children not only to live at home, but to thrive. Cassidy-Graham’s upheaval of Medicaid will cut billions of dollars nationally from the program relative to current law, with no guarantees that the funds must be spent on the same population. Under such funding restrictions, optional Medicaid programs, such as the Katie Beckett Medicaid waiver program created by Ronald Reagan to help families care for their medically complex children at home, will likely be among the first eliminated. In short, under Cassidy-Graham, the vital safety net that Medicaid provides our children is slowly pulled away, with families like ours left to worry constantly whether it will be there when they need it. Eliminating the ban on annual/lifetime limits. Many of our children accumulated millions of dollars in medical bills in their infancy before they ever left the hospital. Under the ACA, insurance companies were prohibited from kicking our children off of insurance plans when their care reached a certain dollar amount. Cassidy-Graham would allow states the ability to waive these protections. This means that parents across the nation sitting bedside in Neonatal Intensive Care Units will once again have to worry not only about whether their child will survive, but also whether the hospital stay will leave them bankrupt. We have heard politicians over the past few days tell us that the Cassidy-Graham bill will increase “flexibility” and “choice” for Americans. That is flatly untrue for our families. Rather, the bill’s provisions will fundamentally disrupt the safety net that our families depend on, likely leaving us only one unthinkable choice: incur debt far beyond our means, or forego medical care that will keep our children alive and able to achieve their God-given potential. As we said at the outset, our nation’s health care laws can and must be fixed. But it is unjust, immoral, and contrary to any reasonable meaning of “pro-life” to pass a health care law that makes it harder for medically complex children to access the care they need to survive and thrive. Our children have done nothing wrong. They do not lack personal responsibility; indeed, they show more strength, bravery, and resiliency in a single hospital visit than many people do in their entire lives. They are just kids who, through no fault of their own, need a little help. You can help them now. Stand with our children. Hear their stories. Work with us to ensure their access to health care is not diminished. We will make ourselves available anytime of any day to discuss our concerns with you in person, and to assist in any way we can toward the goal of a health care system that works better for all Americans.